Issue # 23 of Howard The Duck features a Star Wars parody story and cover art . Actual Size : 6 5/8 " x 10 1/8 "
Unlike the color interior pages of the US editions , the Canadian edition is printed in black and white on the inside . The story just seems to end , so I'm assuming there are other issues , like the US Whitman editions . It appears that it was printed in Quebec and it has the same back cover art from the US Whitman Issue #2 . This paperback reprints the first 6 issues of the Marvel Comics Star Wars series in black and white . Actual Size : 4 1/8 " x 7 "
Awesome comics guys! Thanks for sharing.I read a few of the early trades but only got up to around the ESB mark. I recently bought a bunch of the singles, including the first appearance of Boba, and it has been a lot of fun going through them again. Funnily enough it was actually SW comics that got me back into vintage figure collecting. Christian, that's awesome. Do you have the US Marvel versions or the UK versions? Mate they are the U.S versions. My vintage Danish Star Wars comics. The comic albums on the first pictures are oversized (A4) compilations, each consisting of 6 US Marvel issues. Exeption is Jedi-ridderen vender tilbage, which of cause is the 4 issue mini series of Return of the Jedi. The comics on the second picture is the standard sized comics, each containing two US Marvel issues, with expetion of #20 which is the US #92 double issue. The poster came with the Danish #11 ans similar, but still a bit different, posters came with the Swedish and Norvegian issue. These are newspaper stripes from the Danish newspaper BT, which are translations from the stories in L.A. Times Syndicate. Thanks for the nice words, Clint. You too have a fantastic collection of vintage Star Wars comics. I only started to read the Marvel comics about a year ago and I got carried away by them. Henrik: Cool Danish stuff. Never saw it before. Unlike the Marvel editions , the French Canadian versions are condensed into 2 comics. Actual Magazine Size : 8 1/8 " x 10 7/8 "
Just received these in a bundle of 2000A.D. comics. Bought them just for Prog 333 (promo where they gave away the ROTJ Panini sticker album and a packet of stickers). Also interesting is the comp in Prog 320. Still need to find a copy of Prog 334 in which they gave away another packet of stickers. Don't know if that issue was polybagged or not. 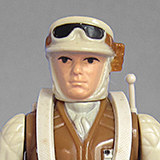 I would like to identify the issues of Eagle and Buster that came with the ROTJ album and stickers but I think that could be a challenge to find them, Buster in particular. My thinking is that the target market for Buster was that much younger than 2000A.D and even Eagle, so far fewer are likely to have survived intact. That's great mate. Love the combo of Dredd and Star Wars! I can't believe they made a Howard the Duck comic. [You must be registered and logged in to see this link.] wrote: I can't believe they made a Howard the Duck comic. And believe it or not it's still going! Stunning. I haven't seen that one before. Added ROTJ French Canadian comics in the post above.